In this post, I will show you a module I created that allows you to compare two computer configurations. In my previous post I showed you a module that allows you to export your computer configuration (Services, Drivers, Software, Process, BIOS settings) in multiple format (CSV, XML, HTML). Using the compare module you can now compare two computer computer configurations by comparing those export. You can compare drivers, services, software and process by choosing CSV or XML exports. The comparison export can be done in HTML or XLSX formats. How to get the module ? 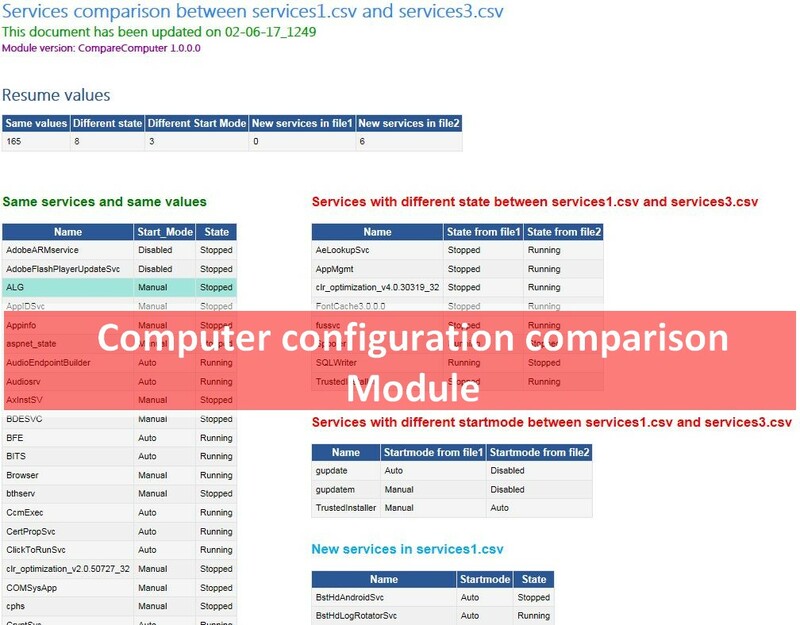 The module CompareConfig is available on the PowerShell Gallery and on GitHub. 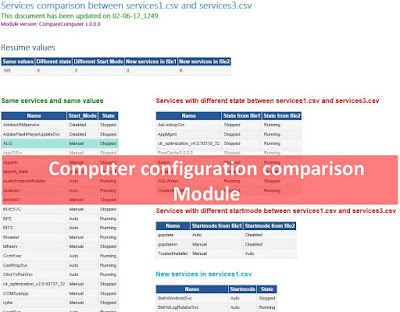 It allows you to compare two services export (CSV or XML files). See below an overview of two services comparison in HTML format. See below an overview of two services comparison in XLSX format. It allows you to compare two process export (CSV or XML files). See below an overview of two process comparison in HTML format. See below an overview of two process comparison in XLSX format. It allows you to compare two software export (CSV or XML files). See below an overview of two software comparison in HTML format. See below an overview of two software comparison in XLSX format. It allows you to compare two drivers export (CSV or XML files). See below an overview of two drivers comparison in HTML format. See below an overview of two drivers comparison in XLSX format. It allows you to compare two hotfix export (CSV or XML files). See below an overview of two hotfix comparison in HTML format. See below an overview of two hotfix comparison in XLSX format.